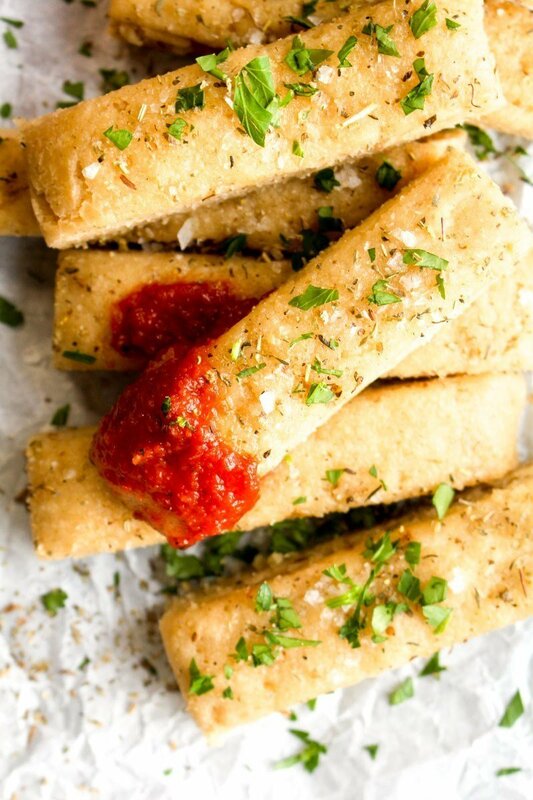 Italian Herb Breadsticks are incredibly soft and buttery but are made with gluten free whole grains and are dairy free! The perfect dinner side recipe. Follow the directions for Gluten Free Pizza Crusts, but stop after chilling the dough. Do not form or bake the dough into crusts. Place the chilled dough on a greased baking sheet. Gently pat it out into a 1 inch thick rectangle. If the dough is sticking to your hands, wash them, then spray them with nonstick cooking oil. Cut the dough into breadstick sized pieces (I made 10 horizontal cuts and 1 vertical cut to make 20 breadsticks, see photo above in post). Cover the breadsticks loosely with plastic wrap and set them in a warm place to rise for 1 hour. While the breadsticks rise, preheat the oven to 350 degrees. In a small bowl, melt the butter in the microwave. Stir in the Italian seasoning, garlic powder, onion powder, and salt. Brush this butter over the breadsticks. Bake them for 15 minutes. Remove and let cool slightly before breaking apart and serving.